Item Number: 99-9-15 19957 Actual Weight: 10 lbs. Pressure-sensitive backing permanently adheres to clean, flat surfaces. 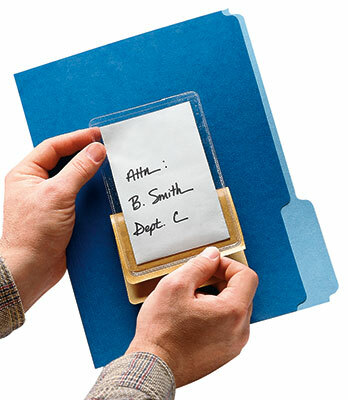 Front-loading style is great for labeling and re-labeling binders and folders. Use to display service dates, instructions, inventory cards, and more. Outside dimensions are 12-1/4" x 18-1/4". Call for details about custom sizes, constructions, colors, and printing.